Turkey has tightened vetting procedures for its “service passports” after a group of folk dancers reportedly sought asylum in Europe where they had originally landed in for an international competition. State-run Anadolu news agency said Ankara police have been examining every application thoroughly ever since a local dancer group was claimed to have left Turkey for an international competition in Hungary and has never returned. 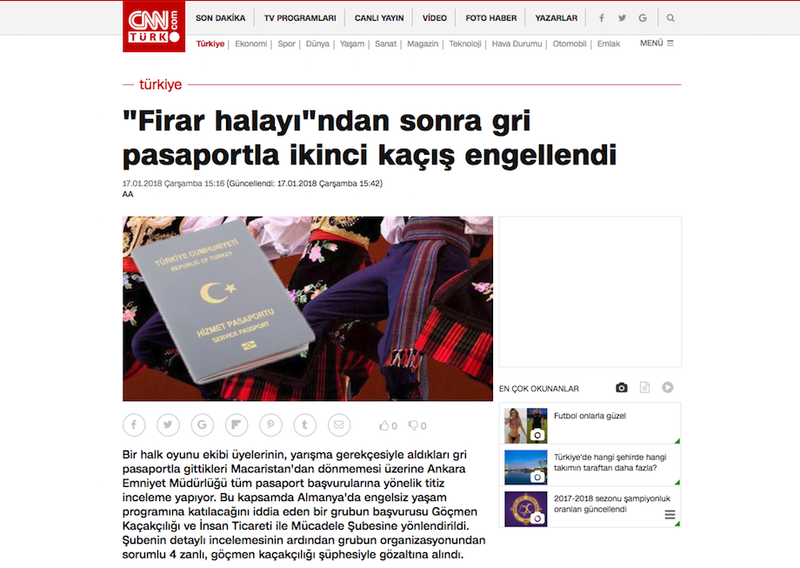 As part of the tightened scrutiny, the Ankara public prosecutor’s office has launched an investigation into a small group of suspicious passport applications upon a complaint by passport officials. Four people were detained on suspicion that they forged documents to register a group of disabled people and their relatives register at a disabled peoples’ association, which is scheduled to attend an event in Germany’s Ratingen. Anadolu said the group applied to get gray passports in an Ankara police station on Jan 11 after their applications were refused in another province. Thousands of people have fled Turkey due to a massive witch-hunt against the government critics in the waked of the 2016 failed coup. Meanwhile, a 42-year-old wrestler, identified as Hakan M., was detained after he attempted to leave Turkey for the 2017 Veteran’s Wrestling World Championships in Bulgaria.